"Admiral Goodrich and Professor Conklin Speak Against Unrestricted Immigration"
Daily Princetonian article describing an anti-immigration speech by Princeton professor Edwin Conklin. 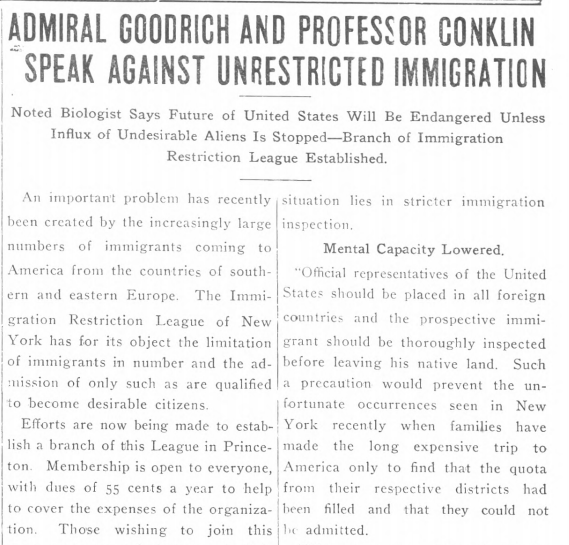 “ADMIRAL GOODRICH AND PROFESSOR CONKLIN SPEAK AGAINST UNRESTRICTED IMMIGRATION Noted Biologist Says Future Of United States Will Be Endangered Unless Influx Of Undesirable Aliens Is Stopped—Branch Of Immigration Restriction League Established.” The Daily Princetonian. December 11, 1922, Vol 43 No 153 edition.